Safelec Services can provide advice on energy-saving lighting solutions not just to the domestic market, but also to commercial and industrial sectors. We can design full lighting schemes to reduce your electricity bills and reduce maintenance costs significantly. Lighting accounts for 8% of a typical household's energy bills and cutting your lighting bill is one of the easiest ways to save energy and money in the home. 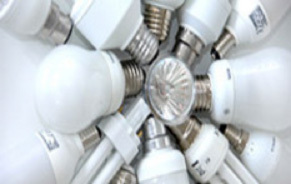 If you replace just one traditional light bulb with a compact fluorescent bulb of the same brightness you will typically save around £3 per year, or £55 over the life of the bulb. If you replace just one 50W halogen downlighter with a 6W LED you will typically save around £4 per year, or £70 by the time you have to replace the bulb.